Knobs-into-holes amino acid (AA) changes is a rational design strategy in antibody engineering, used for heterodimerization of the heavy (H) chains, in the production of bispecific IgG antibodies . H chains of human immunoglobulin IgG interact at the level of their CH3 domains directly, whereas, at the level of their CH2 domains, they interact via the carbohydrate attached to the asparagine (Asn) N84.4 in the DE turn. Figure 1. IMGT Collier de Perles and 3D structure from CH2 domains of human IGHG1 (1hzh, IMGT/3Dstructure-DB). Therefore, the interface between CH3 domains can play a key role for the efficient formation of heterodimers. AA changes are engineered in order to create a knob on the CH3 of the H chains of mAb1 and a hole on the CH3 of the H chains of mAb2. Figure 2. Strategy for obtaining bispecific mAb using the Knobs-into-holes AA changes. mAb1 and mAb2 represent two antibodies with different specificities. 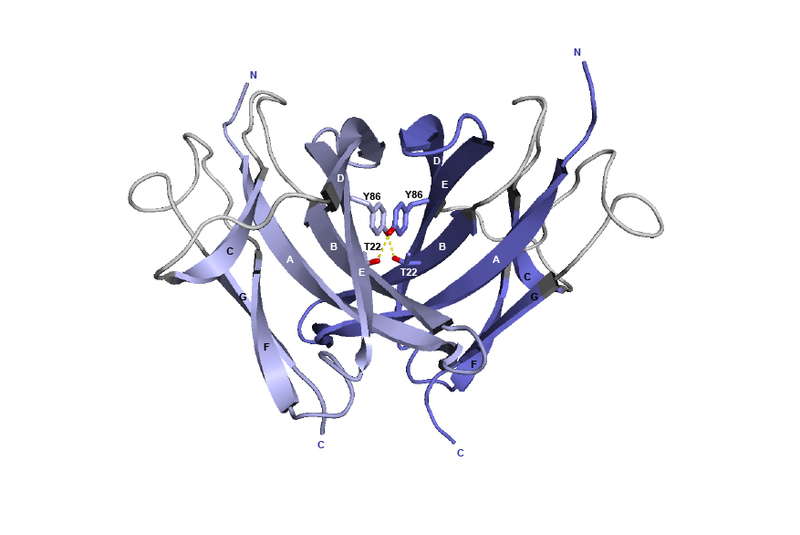 'VH-1' represents the VH domain of mAb1, whereas 'VH-2' represents the VH domain of mAb2. In this example, the light chains (L) of the two antibodies had the same VL domain. Coexpression of these engineered H chains in HEK-293S cells resulted in a mixture of products with the bispecific heterodimer representing the major fraction (92%) . Figure 3. IMGT Collier de Perles from CH3 domains of human IGHG1 (1hzh, IMGT/3Dstructure-DB). Positions T22 and Y86 of the CH3-DOMAIN are shown in the IMGT Collier de Perles, in red circles. T22 (strand B) and Y86 (strand E) are in the [ABDE] sheet at the interface between the 2 CH3 domains. In the interface between the CH3 domains, the threonine (Thr) T22 in strand B is within hydrogen-bonding distance of tyrosine (Tyr) Y86 in strand E on the partner CH3 domain. Y86 of each domain is the principal interdomain contact of T22 as these aminoacids are involved in a hydrogen bond (red boxes). However, Y86 also makes numerous van der Waals contacts with Y86 and with K88 on the other domain (black arrows). Table 1. Interactions involving T22 and Y86 of the CH3 domain of IgG1 H chains. IMGT Contact analysis are from the human IGHG1 (1hzh, IMGT/3Dstructure-DB). Figure 4. 3D structure of the CH3 dimer interface from the human IGHG1 (1hzh, IMGT/3Dstructure-DB). The AA T22 and Y86 are represented, as well as the hydrogen bonds (dotted lines). In the original work , the knobs-into-holes pair was created by the AA changes of T22>Y in strand B of the first CH3 domain and Y86>T in strand E of the partner CH3 domain. The T22>Y AA change created the knob, while Y86>T, in the partner CH3 domain, created the hole. 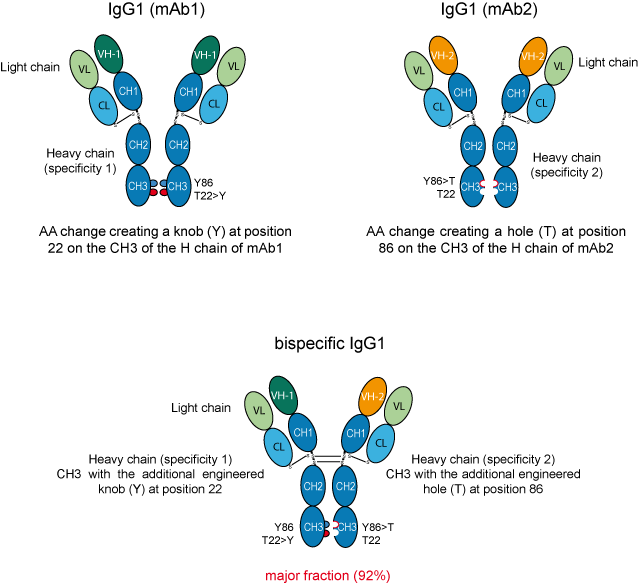 Light chains mispairing was avoided by using an identical light chain for each arm of the IgG-based bispecific antibody . Several other rational design strategies have been used to engineer antibody heavy chains for heterodimerization, using steric complementarity, disulfide and/or salt bridges.